Welcome To COMPLAST Vietnam, the international trade fair for the plastics processing industry, takes place at the Saigon Exhibition & Convention Center of Ho-Chi-Minh-City. In addition to raw materials such as polymers, dyes and resins, the exhibitors also show the corresponding processing machines and technologies as well as forms, chemicals, additives, test equipment and recycling services. Visitors involved in the plastics industry should take the opportunity to come into contact with real experts in a country that achieves the highest growth rate in the plastics industry in South East Asia. This improves the entrance requirements for a new market. The exhibition center where the fair takes place is situated close to the center of Ho-Chi-Minh-City and only 30 minutes away from the international airport. Underground parking is available. The COMPLAST Vietnam will take place on 3 days from Thursday, 20. February to Saturday, 22. 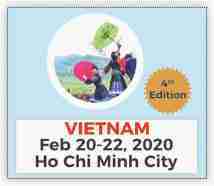 February 2020 in Ho Chi Minh City.